The group's mission is to help educate consumers and professionals about the 8K ecosystem. At CES 2019 it was announced that several leading display technology manufacturers have formed a new coalition to help promote 8K products to consumers and other commercial industries. The so-called 8K Association (8KA) will work on developing the entire value chain for 8K, with an initial focus on supporting the early commercialization and adoption of 8K displays. The new 8KA nonprofit organization includes founding companies AU Optronics (AUO, a panel supplier) Hisense, Panasonic, Samsung Electronics and TCL Electronics, which have all signed a Memorandum of Understanding to advance their common vision and mission. 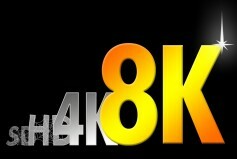 Will 8K replace SD HD and 4K? Building on the newly founded 8K Association and powered by major investments in the latest-generation large-screen 8K-ready panel production facilities—the newest of which enters production in early 2019—TCL will pave the way for an 8K era and actively encourage a wide range of business partners—from streaming services and hardware manufactures—to take the lead in making 8K widely available and accessible. Thus far there has been little to no interest from consumers (in the U.S. or elsewhere), even though 8K TVs have been shown at CES since at least 2012 (Sharp showed an 85-inch prototype that year). And programming is sorely lacking, although Japan’s NHK is now delivering BS8K channel broadcasts in 8K for 12 hours each day via satellite service.